Canadian households continue to be significantly more leveraged than they were before the 2008 recession. But will the Bank of Canada raise rates? They may have no choice. Are household and businesses going to be able to handle inflation pressures they are already experiencing from rising gas prices? Brent crude hits its highest level since 2014. There is also the July 1stdeadline of tariffs being added to US imports. 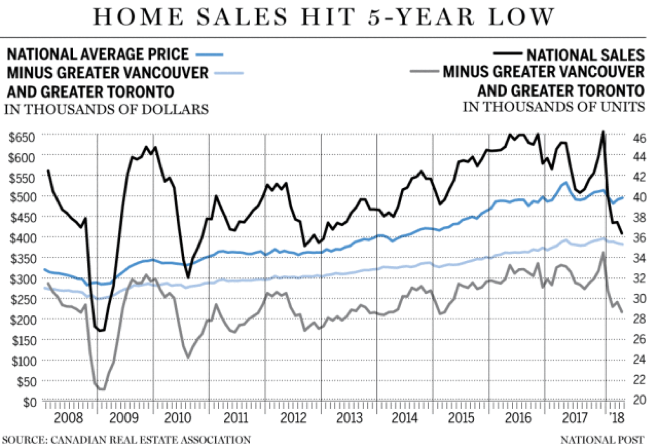 “The problem for the Bank of Canada is this. What do they really control? So,when we get the Bank of Canada press statement, what is it they do? They actually just have an influence on the overnight rate and the overnight rate you can say as sort of an impact to the very front end of the curve. But the reality is that the Canadian bond curve is 90% correlated to the US Treasury market. What are US Treasury yields doing? They’re back up. There’s nothing the Bank of Canada can do about that. US Treasury yields are backing up.We are importing a good part of that into Canada. Mortgages are ultimately priced off the bond curve. And so, look at what happened last week.Even just weeks after the Bank of Canada said we’re are on, maybe on hold indefinitely. Mortgage rates went up last week because of the importation of higher bond yields south of the border. In Australia interest-only mortgages, which during “their recent peak, they accounted for almost 40 per cent of all mortgages. While interest-only loans have a role to play in Australian mortgage finance, their value has limits.” Will overseas funding costs that are impacted by the US increasing rate, rise well? 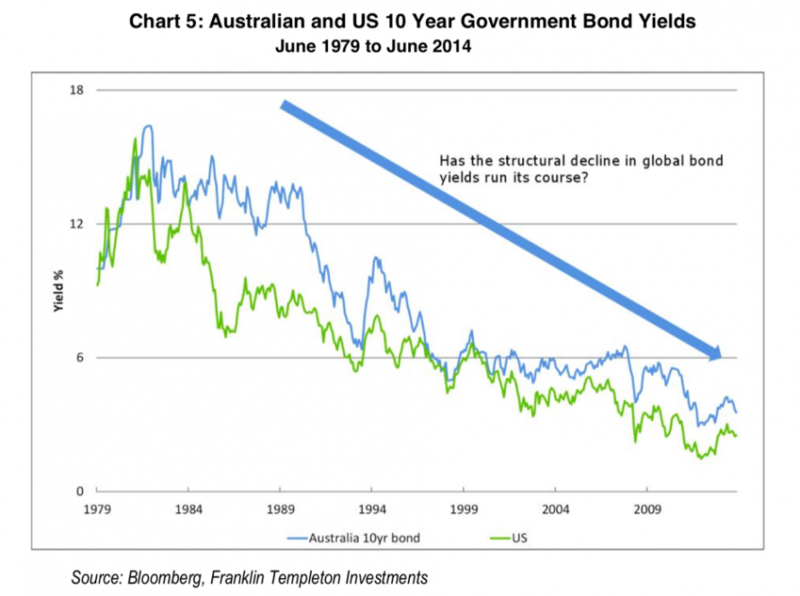 “Over the last 20 years to 30 June 2014 the correlation between Australian and US 10-year yields has been 0.84 measured over quarterly periods with a correlation of 0.71”Source: Franklin Templeton. While not the short-end of the curve, as we have seen recently with many emerging markets rising interest rates is becoming the new normal and Australia will have to raise the cash rate soon if the Fed keeps going. Due to the tight correlation that Australian and Canadian rates have to US rates, we could see banks hike their mortgage rates higher if the US Fed continues to raise its target rate. We would also expect this would further put pressure on both of their housing markets and the capital markets if a broader sell-off takes hold because of the tariffs as had previously occurred in the 2002 tariffs. This may present opportunities for royalty stocks like to provide funding to the sector because capital markets funding through equity issuance and commercial lending from banks would dry up. Gold was the clear winner in the US Steel Tariffs. 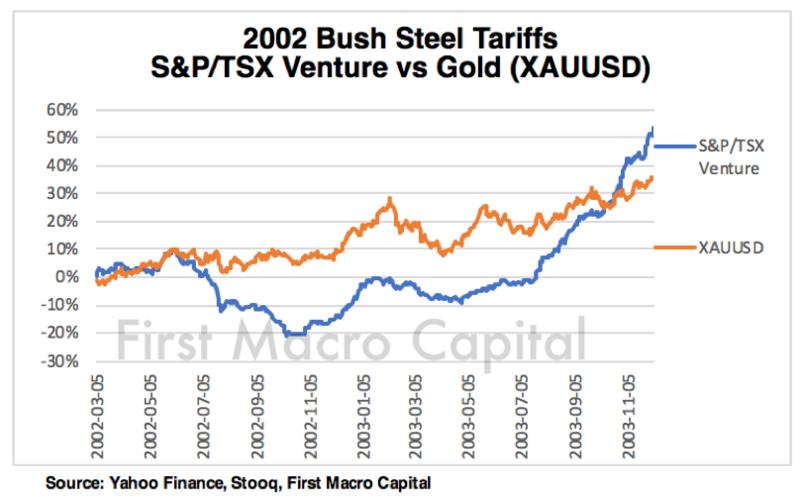 Canada’s TSX Venture Index was the clear index winner in terms of performance because it is heavily weighted in small-cap natural resource stocks in mining and oil & gas. 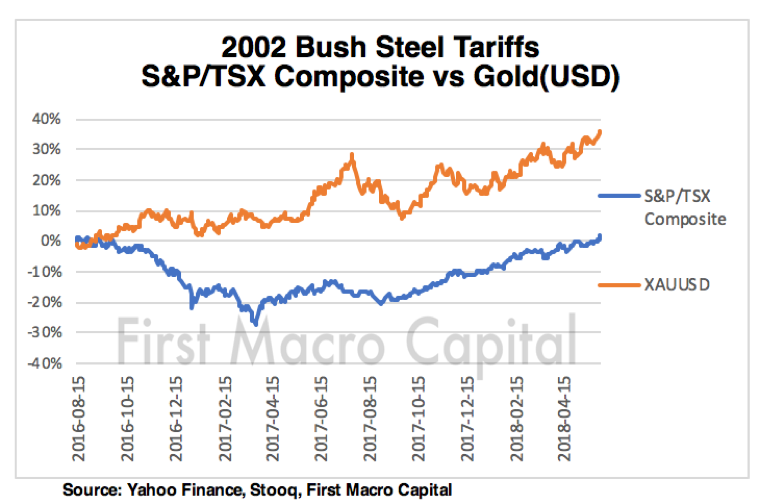 If history repeats, the tariffs may be the signal over a 1-2 year time period, the start of the rotation out of technology and into commodity assets, just like the 2002 US tariffs signaled the rotation into the 2000’s commodities boom. The outlier remains how long will the US Federal Reserve continue to raise interest rate until something breaks? After today, we are getting close. Written by Paul Farrugia, BCom. Paul is the President & CEO of First Macro Capital. 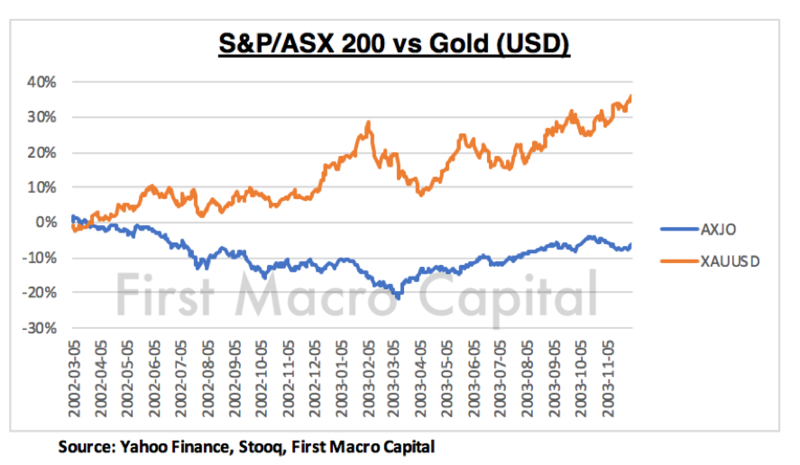 First Macro Capital is a leading investment research firm providing in-depth analysis focused on the resource sector and the broader economy. He helps his readers identify mining stocks to hold for the long-term. He provides a checklist to find winning gold and silver miner stocks and any commodity producer.